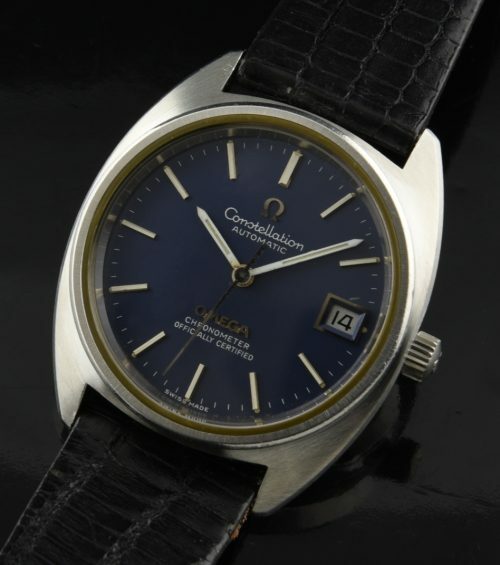 This OMEGA CONSTELLATION dates to 1974 and has an original and VERY UNCOMMON blue-jean dial-I’ve not found another with a BLUE dial such as this! The cal. 1011 OMEGA movement is cleaned and accurate. The 35mm. steel case displays very good condition. The winding crown is original. This should sell fast to one of my OMEGA collector friends. This original blue-jean dial rocks!